A Chinese 100 yuan banknote is placed under a $100 banknote (top) in this photo illustration taken in Beijing Petar Kudjundzic/Reuters. The new tariffs are a high-stake gamble that economic shock and awe can succeed where negotiations have failed. The Trump administration’s announcement that it will move to impose new tariffs on about $60 billion in Chinese imports is shocking, but not unexpected. The administration has been signaling for months that it was readying far more aggressive trade actions, especially against China. It has made it abundantly clear in both words and actions that the United States will no longer be handcuffed by the rules of the World Trade Organization, which forbid such unilateral sanctions. And, while allies will rightly complain about the United States’ blatant disregard for the rules, the complaints levied against China’s trading practices are significant and broadly shared. We are now moving into uncharted territory. In the best case scenario, these actions will prove to be a healthy shock to the global trading system. 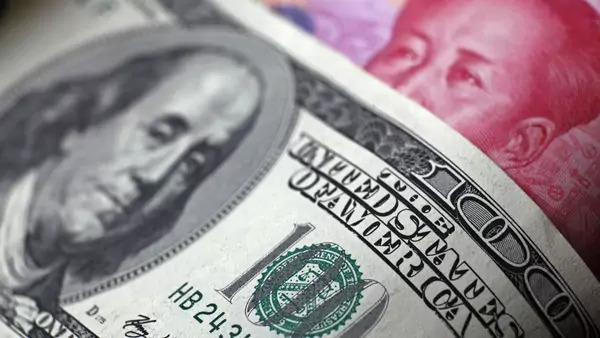 China will realize that it cannot keep using the system for its narrow economic advantage, and will finally act to address the growing complaints from its trading partners and from foreign business operating in China. At the worst, however—and the worst is certainly quite possible—it will provoke a broader rupture that does serious damage to U.S.-China relations and to the global economy. The administration is delaying the action to solicit comments from affected U.S. companies, and it is quite possible the final tariffs will fall short of the threats. The threatened steel and aluminum tariffs, which were set to be imposed March 23, have now been delayed for many countries. The same could be possible here. But let’s assume President Trump is determined to move ahead and won’t be dissuaded by the huge pressure that will be brought to bear from opponents in Congress, the business community, and U.S. allies. Having just spent the past several days in China speaking with think tank counterparts there, I have three observations. First, the United States must lay out clearly what it seeks from China in exchange for removing the tariffs. For example, when President Richard Nixon in 1971 suddenly pulled the United States out of the Bretton Woods system of fixed exchange rates and slapped a ten percent tariff on most imports, his goal was clear—to force Japan, Germany, and other countries that were running large trade surpluses to revalue their currencies against the dollar. A negotiated settlement was quickly reached and the tariffs were removed. But in this case, other than broad complaints about a series of longstanding Chinese practices such as intellectual property theft and forced technology transfers, the administration has not issued any clear demands. Instead it appears willing to leave the tariffs in place indefinitely. That is a recipe for a growing, damaging trade conflict in which China will have no choice but to retaliate. Secondly, the United States and China urgently need to restart economic talks. The Trump administration, frustrated by what it justifiably sees as years of empty promises, has shut down those dialogues. China’s top economic official, Liu He, was rebuffed when he came to Washington earlier this month with proposals to restart talks. But if the two sides are not talking, there is no chance of a constructive resolution to the dispute. Premier Li Keqiang, in his press conference this week at the close of the National Peoples’ Congress in Beijing, made a series of promises to cut tariffs, protect intellectual property, prohibit forced technology transfers, and take steps to reduce the trade imbalance with the United States. The statements at least suggest that China is taking the U.S. threats seriously. The Trump administration may well be justified in insisting on concrete, shorter term results rather than simply new Chinese promises of economic reform. But the longer the two sides are not talking, the greater the danger of misunderstandings and damaging responses on both sides. Finally, the administration must make it clear that what it seeks is a renewed economic relationship with China on fairer terms, not a broader conflict with China. The Trump administration has embarked on a global effort to remake its trade relationships, picking fights with Canada, Mexico, the European Union, South Korea, and others. China must be seen as just one piece in that effort. But in China, many see the tariff threats as part of a package of hostile U.S. moves aimed at isolating and punishing China. These include the harsh language on China in the Trump administration’s new National Security Strategy, which twinned China with Russia as “revisionist” powers challenging U.S. interests. And China was infuriated by the little-noticed (in the United States) decision by President Trump to sign the Taiwan Travel Act, which promotes official exchanges between the United States and Taiwan and is seen by China as calling into question his promise to Chinese President Xi Jinping to respect the “one China” policy. China is likely initially to respond in a measured way. The fact that the United States is acting alone will encourage China to consult first with other countries that have also been targeted by the Trump tariffs. And the notice and comment period will provide a bit of breathing room for cooler heads to prevail. But it is still a perilous moment. The administration appears to be acting with clear purpose—to deliver a shock that will force a rebalancing of economic relationships with its trading partners, most importantly with China. It is vital that Trump officials communicate their goals and intentions clearly and provide a path to a resolution. Otherwise, there is a serious danger that events could spiral out of control.